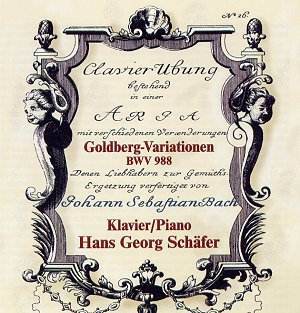 The Goldberg Variations is normally an approximately 80 minute work if all of the repeats are observed. Until recently its length was a big issue as it was a problem in the LP era. In fact 80 minutes is not all that comfortable in the CD era either. Bella Musica have had to give Hans Georg Schafer a second disc as his Goldberg runs to eighty-two minutes. He does however play all repeats. Some companies seem to give their pianists instructions to fit the work onto one CD (which is quite sufficient). Andrei Gavrilov on DG seems to fall into that category. He takes the opportunity to use the piece as a dazzling display of virtuosity. Chen Pi-hsien for Naxos in 1987 managed to squash the work into less than an hour by playing no repeats at all but being more leisurely in the slower movements. The question ultimately is: do you want a version on piano or harpsichord. I have to admit that I have one of each because the work sounds so different on the piano. I would not want to be without Gustav Leonhardt�s virtuosity and his deep understanding of the work on the harpsichord (Teldec) and Murray Perahia�s touching and sensitive pianism (Sony). So now to this new version. The biography and website given to Hans Georg Schafer is impressive and very interesting. He has studied composing, conducting, particularly opera where he has worked in a series of German, Italian and American theatres. He was also the managing director of the Berlin Philharmonic in the 1980s. He has been responsible for the Frankfurt Bachkonzert and the Kothener Bachfesttage and for twenty years headed the Bachwoche Ans-bach. I mention all this, and there is in fact more, because Schafer, although an experienced and highly cultivated pianist, comes to Bach�s Goldberg variations as a Bach expert but even more importantly as a rounded musician with considerable experience in many fields. Whilst this is very fine does it make in any way for a great performance. My answer, I�m afraid, is not really. The Goldberg Variations is not about virtuoso playing but about virtuoso composing in different styles: in short everything to do with counterpoint on a keyboard. The player needs to understand every bar. Schafer does all of these things and is a studious and where necessary an exciting and sometimes a passionate pianist (hear Variation 16). There is nothing �wrong� with this performance in any way though I suppose one could quibble about tempi (Variation 4) or phrasing and articulation (Variation 15, the demanding Quodlibet). Schafer�s recording is perfectly good, inoffensive and clean, complete, generally satisfying and enjoyable. All that said Schafer�s set suffers when considered alongside the Perahia recording, which I love, or, that by Glenn Gould (warts and all) or by the wonderfully sensitive Angela Hewitt (Hyperion). I can�t really find extra shelf space for this one. I can�t even recommend it as a first choice for those of you with no Goldberg Variations in your collection as yet. So, I�m sorry that I cannot be more positive, it is a strong field. The accompanying notes, perfectly well translated, give a good background to the work and some useful analysis. There is also a brief discussion of tuning because the piano has been oddly retuned for this recording representing "a compromise between mean-tone temperament and today�s equal temperament" (spot the difference). If you can listen to this CD in the shop ask for Schafer�s thoughtful and beautiful approach to Variation 25 which he takes nine minutes over. You will also possibly detect the unusual tuning. The recording is, like the performance, unexciting but perfectly adequate.